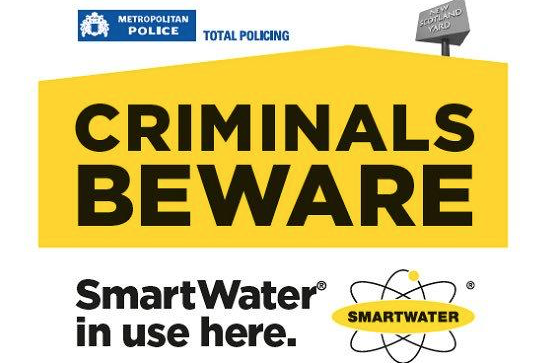 In an attempt to reduce crime, it has been agreed with the Metropolitan Police to trial SmartWater within the Ashburnham Triangle. SmartWater is a way for police to definitively link your valuable items to you. Almost invisible to the naked eye, the advanced liquid glows yellowy-green under UV light and every bottle has a unique forensic code. This means if an item is recovered by the police which is marked by SmartWater, such as a bicycle, the police can use forensic analysis to identify the address and return the bike to its rightful owner. It can be used to invisibly tag all your valuable items, from watches and jewellery to laptops and mobile phones. The application will last approximately 5 years and it's almost impossible to remove. To date, the use of SmartWater has had a 100% conviction rate in court and has been proved to reduce burglaries by 85%. There are 100 kits to be given to residents within the Triangle. To receive your kit you will need to be available on Saturday 2nd February between the hours of 10am and 2pm so a member of our Safer Neighbourhood Team can visit you and provide you with your unique SmartWater kit. They will also happily provide general crime prevention advice at the same time. Please note the kits will be on a first come first served basis - once they have gone, that's it. Please also ensure that you will definitely be available on Saturday 2nd February between 10am and 2pm.